I first started making these way back when Chris and I were first engaged. I was going to school full time in Greeley finishing up my bachelor’s degree in Psychology, working full time on the psych unit, and living with Gino and crew in the house on Cranford Place. Chris was living in Denver going to A&P school full time, working evenings full time as an armed federal security guard, and renting a room from Josh and his dad, Gib. I would make this dish and rotate it out with a few other dishes, prep it in Greeley, travel the hour south and bake it at the apartment when I would stay the night at the bachelor pad. They were a happy bunch of guys when I brought real, home cooked food. Since I’ve been making it for so long, there’s no “formal” recipe to base it off of. And, as I’ve made it through the years, you can be certain I’ve tweaked it along the way. I tried to pay more attention to specifics when I made this on Sunday, and like most things I cook, I base it off of taste and smell as I’m prepping. Hopefully, you’ll get the gist, & by all means, modify accordingly based on your preferred taste. Boil the chicken breasts until cooked all the way through. A fryer and/ or the meat from a rotisserie chicken, also works well. Once cooled, shred the chicken. In a Ninja or other food processor, quarter the onion, toss in the garlic (I always buy a big bag of ready to use peeled garlic), deseeded & halved jalapeno, and cilantro and pulse a few quick times. Mix this into the shredded chicken, toss in the green chili, and season with S&P, cumin, & red pepper flakes. This is where I do my first taste testing to see if I’m happy with the level of seasoning – notice how I don’t have measurements for these. Once I’m satisfied, I pour about half a can of the green enchilada sauce into the chicken mixture. This prevents the chicken from drying out during the baking process. Set aside. Pour the remaining enchilada sauce in a 9×13 pan and spread across the surface. After frying one or two, it will have cooled enough so that you can begin to assemble and roll the enchiladas all the while frying the tortillas as you go. 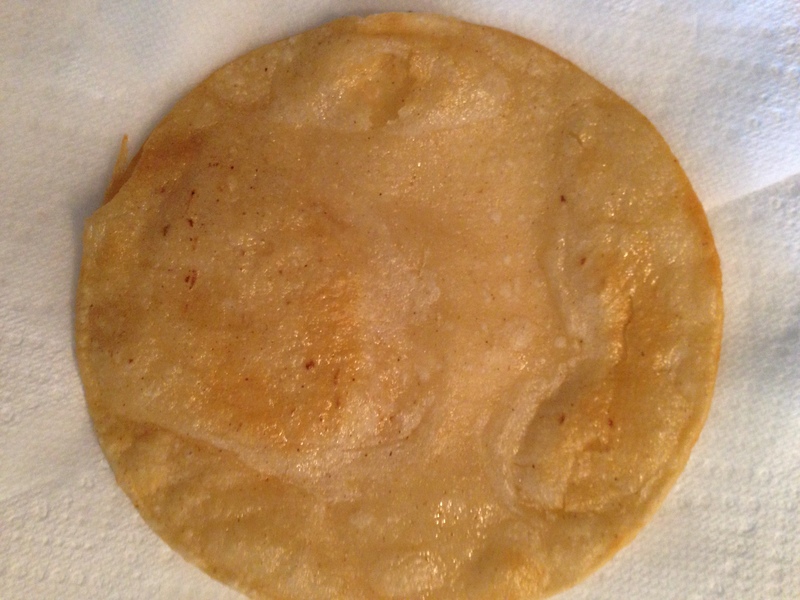 For each tortilla, place approximately a 1/4 cup or 1/3 cup of the chicken mixture on the edge of the tortilla, roll, and place into the 9×13 pan. Repeat until you have no chicken left. At this point, you can bake or cover and place in the refrigerator or even the freezer for a later date, thaw completely before baking. If you’re ready to bake, preheat the oven to 350 degrees. Bake uncovered for 25 – 30 minutes. 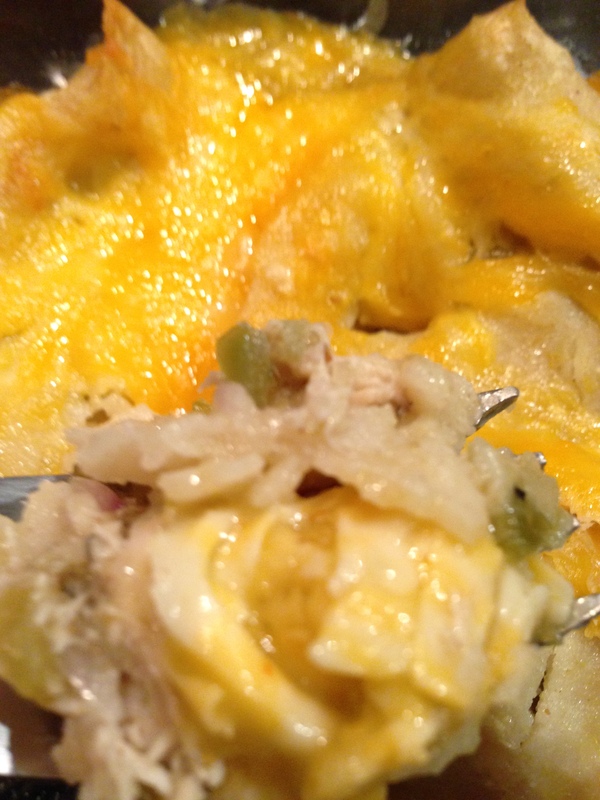 Remove from oven, top the enchiladas with the remaining can of green enchilada sauce and spread with cheese. Return to oven and bake for another 10 minutes or until cheese is melted. Once melted, turn on broil to low to toast the cheese a light golden color. Garnish with additional chopped cilantro, if desired. Serve with beans and rice. This entry was posted in Chicken, Mexican. Bookmark the permalink.